Do I Really Have To Pay Quarterly Taxes? The answer to this question for most San Diego business owners is unfortunately yes. The last thing any business owner wants to think about is taxes and nothing could be worse than thinking about taxes four times a year. Yet putting money aside to cover a tax bill isn’t the worst layout a business owner can make during any given year. One way or another, Uncle Sam is going to get his percentage. It would be better of course to keep those quarterly tax payments in the bank earning interest, but in the grander scheme of things the lost interest is negligible for most new and growing businesses. Regardless, the IRS requires quarterly payments and exacts penalties and interest from those that ignore or are ignorant of the code. The big question then becomes, how much? If you expect a first year loss or very limited net income and expect to owe less than $1,000 in taxes, you don’t have to worry. If you expect to owe more than $1,000, then you should pay quarterly estimated taxes to avoid penalties. The IRS expects you to pay, at a minimum, the smaller of: 90% of the tax to be shown on your next year’s return or 100% of the tax shown on your last year’s tax return, if that return covered all 12 months of the year. If your prior year’s adjusted gross income exceeded $75,000 on your individual return, or $150,000 with your spouse, the 100% is changed to 110%. 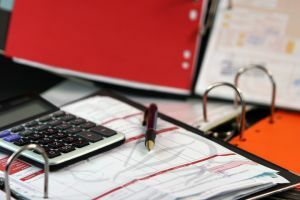 Existing businesses can choose the second option and make quarterly payments that equal 100% of the prior year’s tax payment (or 110% if the prior year’s adjusted gross income was in the higher bracket) and forego performing complex calculations. If your business is in its first year or expects to earn considerably less than the prior year and you are uncertain how to proceed, consult your accountant (preferably a CPA who should be an important part of your business’ team of advisors). You may also personally use the IRS 1040EZ worksheet to estimate your tax due for the following year, but you will want to be sure that you make a good estimate of your business’ income. A good accountant can ensure that you legally minimize your tax burden and avoid penalties. When you’re ready to make your quarterly payments, use the 1040EZ and either mail in the payments with the Payment Vouchers as instructed or pay electronically (see the IRS Electronic Payment Options Home Page).